A Mountie from Ten One Design shown on an iPhone 5S for scale. First off, I have to spend a moment on the packaging. No thick plastic nightmare, just some clear tape around the edges. It's wonderful to get right to the goodies without having to break out the heavy machinery. Both the top and bottom "unfold" and there's your Mountie. You can use the Mountie with all these different devices because it comes with some rubber inserts of various thicknesses to hold devices firmly. In fact, the only documentation in the package is a small piece of paper that lists which insert to use with different devices. I tested the Mountie with my laptop sitting in my lap. I clipped it to my MacBook Pro screen, and then mounted my iPhone 5s. There was virtually no change in operating my laptop, it was just handy to have my iPhone at eye level. And a nice way for "laptop in my lap" users to sync and charge devices without a dock or losing a phone in couch cushions or worse. Then I swapped out the pad in the Mountie and clipped in my Nexus 7. I could feel a difference in the balance of my MacBook Pro, but it wasn't major. My laptop still sat in my lap just fine, and this just gave me another reason I feel like I need an iPad mini. It would do a great job alongside my screen. Now for the big boy: I swapped out the insert again and strapped in my iPad Air. Now this was more obvious, there's no missing that you have an iPad hooked to your screen. It still sits fine in my lap, and my iPad felt secure. I tried it both in portrait and in landscape, and with video chat it felt fine in my lap and worked well. Pairing this with the magic of something like Air Display or Status Board to put your iPad to work as a true second screen no matter where you set up shop. 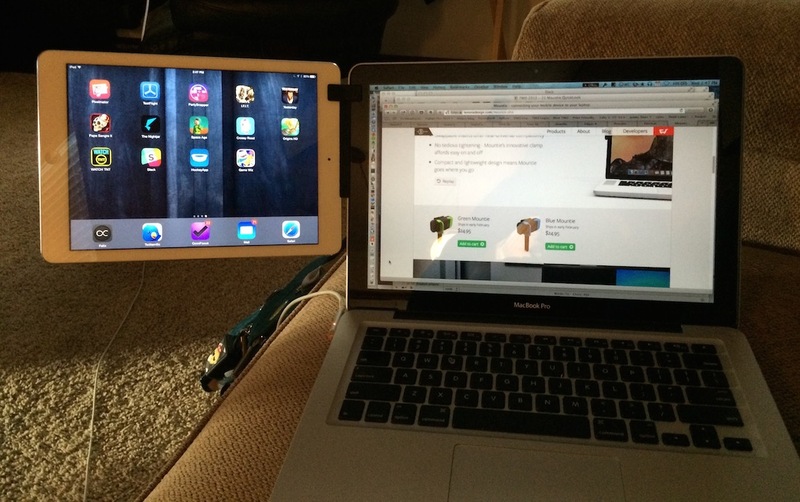 Using the Mountie with a 13-inch MacBook Pro and iPad Air. So far my only concern is that the feet only have letters on them, so unless you have the paper or a clever labeling system you won't know which inserts to use, and they don't come in a resealable bag so keeping them together might be a challenge. This is only a concern if you are switching devices regularly, and at worst it's a small inconvenience. My only other item to note is this: Fresh out of the packaging, the inserts smell like new rubber. I definitely noticed it when I opened the package, but it dissipated over time so even if it bothers you it won't last long. It fits fine in a jeans pocket, so finding room in a laptop bag should be a piece of cake. It's very light and comes with your choice of green or blue clips. Currently the Mountie is available for pre-order from Ten One or your choice of resellers at US$24.95 and it's a clever way to manage your mobile screens. I highly recommend it for anyone who has multiple screens and wants an easy way to view them all.